 Cheddar is a cheesesteak staple, but some people prefer provolone. Here’s the recipe from Life In The Lofthouse. According to Tony Lukes’s, a venerable Philadelphia emporium, American cheese is the most popular (photo courtesy Tony Luke’s | Visit Philly). Make cheesesteak with an international flair, like this Korean-fusion version with bulgogi beef, hot chiles and sriracha on a baguette. Here’s the recipe. 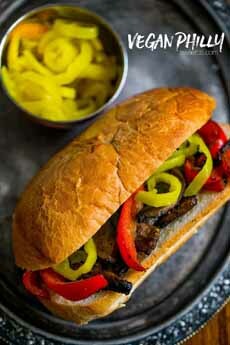 A vegan “” has grilled vegetables that can be added onto cheesesteaks. Here’s the recipe from Sweet CS Designs. What is cheesesteak? It’s not a piece of cheese slapped onto a steak, like a cheeseburger. Rather, it’s a chopped fantasy of flavors that many Philadelphians revere as their favorite fast food. 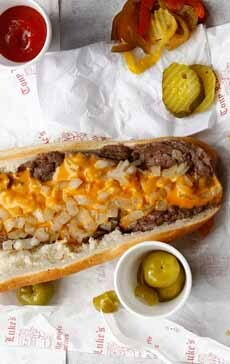 Cheesesteak (photo #1) is made of thin slices of grilled steak, covered with melted cheese and served on a long roll. Traditionally, it includes grilled peppers and onions or hot cherry peppers. It has been personalized with different ingredient options at different cheesesteak emporia. 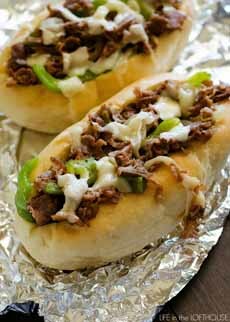 HOW ABOUT A CHEESESTEAK PARTY? When the grill comes out for the season, consider a DIY cheesesteak party. It’s fun to build your own (blue cheese, anyone?) and see what others have created. 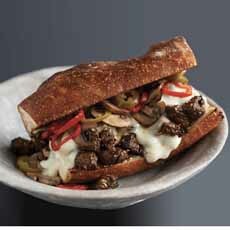 You can make it a gourmet cheesesteak party with better steak, better cheese, better bread and toppings (e.g. caramelized onions). Cheese (cheddar or American is standard [not to mention Cheez Whiz], but also consider asiago, blue, goat, gruyère, provolone, etc. Classic marinade: olive oil, lemon juice, garlic powder, dried basil, dried parsley, Worcestershire sauce, soy sauce and black pepper. Optional: hot sauce and sliced fresh garlic. Giardiniera, a pickled Italian relish. Buffalo chicken hoagie: chicken, buffalo sauce and fried onions. Cheesesteak hoagie, cheesesteak plus hoagie dressings (lettuce, tomato, mayonnaise). International variations, like the Korean cheesesteak in photo #4. According to VisitPhilly.com, Philadelphia’s official tourism site, the cheesesteak in the 1930s by Pat Olivieri. Olivieri was a hot dog vendor in South Philly. One day, he expanded his menu by adding some sliced beef to the grill. A cab driver was lured by the aroma of grilling meat, and ordered a steak sandwich, which he received on an Italian roll. By the next day, the buzz about the sandwich had spread among cabbies; locals were attracted to it; and shortly Olivieri opened a shop on 9th Street and Passyunk Avenue, called Pat’s King of Steaks, to sell his steak sandwich. But it was still not a cheesesteak! According to nephew Frank Olivieri Jr., the cheese was added in the 1940s by an otherwise unspectacular employee named Joe Lorenza, who added slices of provolone to the sandwich [source]. Eventually, he added cheese to the recipe. The friendly rivalry wages on decade after decade, as do the arguments among customers as to whose cheesesteak is better. Word spread rapidly through the cabbie rumor mill, and drivers from all over the city soon visited Olivieri for steak sandwiches. Olivieri eventually opened up Pat’s King of Steaks on 9th Street and Passyunk Avenue. manager Joe Lorenza, according to Philadelphia Magazine. By the way, if you’re in town, both Pat’s and Geno’s are open 24 hours a day, seven days a week. Other cheesesteak vendors have popped up developed their own loyal clientele.